Manga Diaries by a working mother Mitchan bringing up funny two boys in Japan. 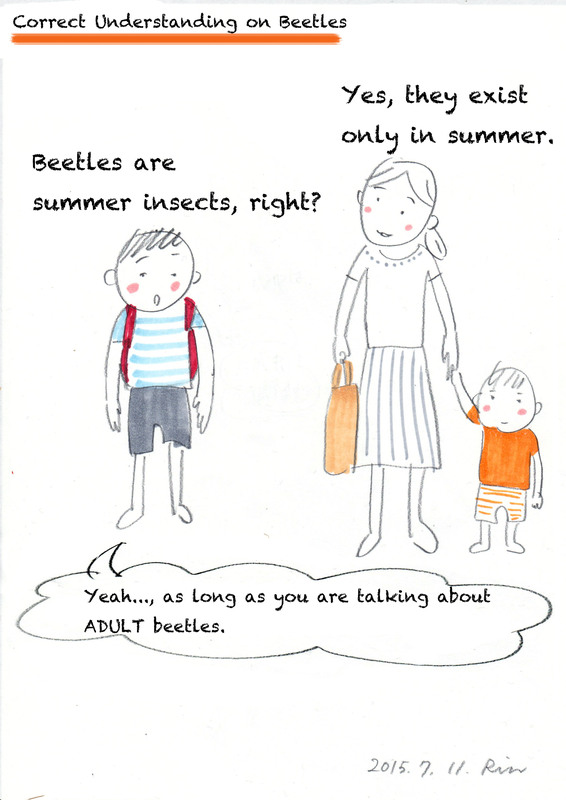 “Beetles are summer insects, right?” When we came home from nursery school, Taka said to me. So I said, “Yes, they only exist in summer.” without any question. But he had a question. He said, “Yeah…, as long as you are talking about ADULT beetles”. He implied that as the beetle larvas exist all the year around, you can’t define beetles as the summer insects. Our world is not only consist of aboveground world but also underground world! This entry was posted in 03_First Son (Taka) on 2015/08/02 by mangadiary.